Dear VC, Is My Big Business Idea Too Scary For Investors? 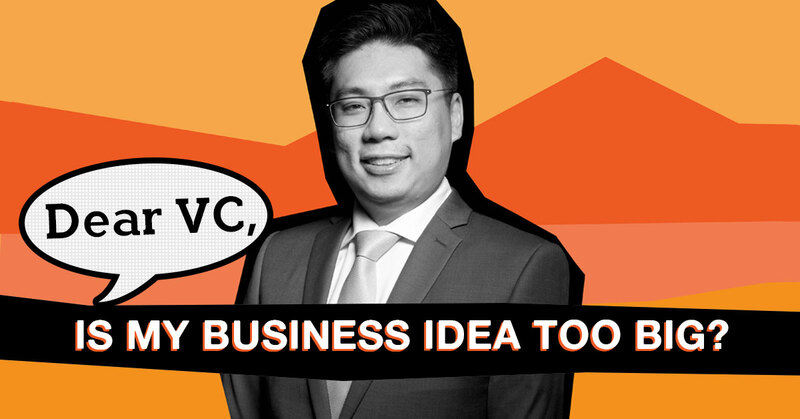 For the third installment of Dear VC, ST Chua of SunSEA Capital addresses two interesting queries from our readers—how to convince VCs to invest into an ambitious idea, and how to grow as a startup in the digital marketing sector. I once scared away an investor because our project was too big, and we probably asked for too much. If a startup with bigger potential than Facebook appears, what is the right amount to ask for? We’re building something huge related to government policy with regards to the fourth industrial revolution that will affect the country’s ecosystem and infrastructure but requires a huge investment to start with. In line with the new government plan for Vision 2020, we have come up with a new innovation similar to GST collection that is more sustainable and will replace the income loss from abolishing GST. It sounds like a massive project that requires the government’s approval, but the returns are also very high and has the potential to disrupt the industry. Do investors look at ROI, sustainability, or the effect on citizens? If we propose this to the government, we could get funding from the Ministry of Finance, but it’s more likely that we’ll get rejected because we are a new startup. But we feel this is good for city planning and the well-being of the public, so how do we get our idea out there and get funding? We are trying to reinvent the tax system but it’s not an easy process. Do you have any suggestions for us? For your project, I would suggest that you try building up a test case to validate all your assumptions. Try to work out a small use case and build a prototype. If it works, then the business model is validated, which makes it easier to go for investors, a bigger community or city, followed by the government. For this there are many startup accelerators or angel groups that you can approach to mentor you for market validation. Investors (including government ministries who are even more cautious as they’re handling public funds) or even grant providers are likely to look for returns, as most investors have a specific investing period for which they need to deploy the money for investment and execute an exit within the fund’s period. Another factor you may want to take into consideration is that government approvals will take time and if it’s above a certain cost, you will first need to be an approved vendor by if you approach any ministries. Lastly, I would like to also suggest that you re-evaluate the descriptor of “bigger potential than Facebook”, as that will immediately throw off investors (who are usually realists) as it might signal wishful thinking. The probability of topping Facebook is very low. I am currently running a startup digital marketing agency that focuses on helping small businesses digitalise their business processes. We build e-commerce sites that focus on conversion and retaining customer loyalty digitally. We realise that many businesses in Malaysia that are making over RM50,000 or even over RM100,000 still use WhatsApp or Facebook Messenger as their sales channels—this requires a human to serve the prospect/customer and is a waste of resources and money. Simply put, there are actually a lot of businesses that aren’t aware of the benefits of e-commerce. This year is our first year, and we’re focusing on trying to proof the concept, and so far we have built over 20 e-commerce stores and have worked with over 40 brands/businesses (consulting, running, and strategising paid ads for them). We are not competing with big agencies, we have our own market. We have made over RM100,000 revenue in our first six months and we started this business with zero capital. Since we are also marketers, we know how to build sites that are marketing tool-friendly like SEO, SEM, Facebook ads, and email. We would like to know on how to grow our agency and how investors currently view this gap. First and foremost, congratulations on running it lean and gaining some revenues and traction without coming up with any capital. Personally, I highly encourage founders to not depend on external capital when thinking of any businesses to start. Making it sustainable should be a priority for startups and founders should only set their sights on external capital when they need to scale. On your question on how to grow your agency: grow your clients and go deep to produce solutions that address their pain points. In our region, messaging commerce—some call it conversational commerce—is a big thing and it works for many. Reasons for this can be plenty, ranging to pure familiarity, to some who have been jaded or had bad experiences spending money building their own e-commerce platforms. Many expected immediate results when the fact is driving traffic to any new e-commerce site requires money, patience and resources. So one way to think about it is how can you make it easier and better for them? As for investors, different investors have different mandates and focus areas. Some may want technology to scale and in your case, it is tough to scale as it is quite human-resource intensive along with lots of on-ground customer engagement. You may want to look at how you can automate things. That being said, there are some strategic investors who may want to extend their footprint to your market, but whatever it is, focus on doing your business well and continue to build customer loyalty while attracting new ones. A big question that you will have to address is how do you differentiate your startup from the hundreds of digital marketing agencies in the market? What are the factors that make you stand out? By identifying this crucial point, you would be able to gain more market share and investors. ST Chua is a serial entrepreneur with global experience in venture investing, venture building and exits. He is currently the principal for Sun SEA Capital, a US$50 million VC fund based in Malaysia that focuses on growing and mentoring scalable technology startups in Southeast Asia via Series A funding rounds. ST is also a strategy and business development consultant, having graduated with an MBA from INSEAD, France, and he believes that blockchain will power the next revolution, helping propel forward efficiencies for people, planet, and profit. Dear VC is a series where we get experienced venture capitalists to answer startup, funding, and venture capital-related questions from our readers. If you have a question you’d like to ask, please fill out our questionnaire here. You can also find more investor insights by reading our previous Dear VC segments here.